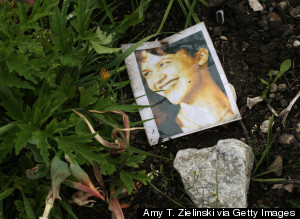 Every suicide leaves behind mourners grasping for answers, but when the person in question is a high-profile celebrity known to have struggled with mental health issues, it's tempting to fall back on the age-old trope of the "tortured genius." It's an idea deeply embedded in our culture: the artist, musician, poet, novelist or comedian who excels in his or her field, but is tormented by inner demons. By this logic, the coexistence of creativity and mental illness is not a coincidence: The talent and the demons are thought to be inextricably linked. The torment is part of the gift. The World Health Organization estimates there are 350 million people on the planet living with depression. And the recent death of Robin Williams has stirred up the old question of whether creative genius carries with it an elevated risk of mental illness. "It stands to reason that some of those people are going to be creative," Harvard University's Shelley H. Carson, Ph.D., author of Your Creative Brain, told The Huffington Post. "Certainly enough to form public opinion." The idea that "great art comes from great pain" has long-standing roots in public opinion, rumored to date back to ancient philosophers and poets, but our modern idea of the tortured genius likely stems from a glamorization of mental illness that took hold during the Romantic Era. At that time, so-called "madness" was seen as "voyaging into new planes of reality," according to psychiatrist Allan Beveridge. And while it's easy enough to believe that pain helped to fuel the work of Kurt Cobain, Sylvia Plath, David Foster Wallace or Alexander McQueen -- to name just a few of the brilliant, creative, successful people who took their own lives after battling mental illness -- there is also great art that comes from no pain whatsoever. A photograph of American writer and poet Sylvia Plath on her grave in Heptonstall, England. Plath committed suicide in 1963. "There are plenty of geniuses who are not mentally ill, and there are plenty of mentally ill people who aren't geniuses," said HuffPost Mental Health Medical Editor Lloyd Sederer, M.D., medical director of the New York State Office of Mental Health. "Sometimes you have the two combined. When you have geniuses who have such prominence, like Philip Seymour Hoffman or Robin Williams or John Nash, they make you think that this is more common than it is," said Sederer. "One in four people annually in this country has a mental illness that impairs their function. That's pretty common. The illness is pervasive. Genius is much more rare." The cognitive-neuroscience community is divided on whether a scientific link between creativity and mental illness actually exists. The earliest cited investigation into the issue came from the Italian clinician Cesare Lombroso, who argued in 1888 that "genius and madness were closely connected manifestations of an underlying degenerative neurological disorder," according to the Psychiatric Times. In recent decades, there have been a number of attempts to find a firm empirical basis for that idea. Some correlative points have emerged: There is research suggesting that people with bipolar disorder, as well as the healthy siblings of people with bipolar disorder or schizophrenia, are more likely to have creative occupations. People with certain genetic risk factors for schizophrenia have been found to be more creative. In 1989, Kay Redfield Jamison, Ph.D., who herself has bipolar disorder, found a high prevalence of mood disorders among a group of British writers and artists. And in 1987, Nancy C. Andreasen, M.D., Ph.D., found a higher rate of mental illness among 30 creative writers than among 30 equally educated non-writers. Past research, like Andreasen's, relied heavily upon hours of interviewing and application of the diagnostic criteria of the time to identify mental illness. Today, researchers have moved toward administering creativity tests to subjects while monitoring their brain activity with a procedure known as fMRI, or functional magnetic resonance imaging. But other experts say that results showing a link between creativity and mental illness are unconvincing. They point to small sample sizes and a dependence on self-reported biographical data from subjects. In fact, even research with large sample sizes is routinely called into question for failing to establish objective measures of creativity. Part of the problem in determining whether or not this link exists is that creativity has proven difficult to quantify in research. Andreasen, director of the Neuroimaging Research Center and the Mental Health Research Center at the University of Iowa's Carver College of Medicine, acknowledged that limitation in a recent column for The Atlantic. Measuring creativity is "a necessarily controversial task," she wrote, "given that it requires settling on what creativity actually is." The general consensus in the field is that a creative idea or product is new or original and useful or adaptive, Carson told The Huffington Post, and that a creative person is able to take pieces of information and "recombine them in novel or original ways that are somehow useful or adaptive." Carson's research explores what she calls the middle ground between the researchers who believe a link exists between creativity and mental illness, and the researchers who don't. She espouses what she calls a shared vulnerability model -- the idea that a person's chances of mental illness and her chances of being creative may stem from the same place, but that neither one causes the other. The outcome -- creativity, mental illness or both -- ultimately depends on other factors, like high IQ or strong memory. Recent research from Austria builds upon this idea. A 2013 study found that people who scored high for creativity and people who scored high for schizotypy -- that is, behavior suggestive of schizophrenia but not diagnosable as such -- "share an inability to filter out extraneous or irrelevant material," Fast Company reported. This would allow more information into the minds of both creative people and people at risk for mental illness, and "if you have more bits of information [coming in], it stands to reason you may come up with more connections," said Carson. But the problem with defining creativity in this way, argues Keith Sawyer, Ph.D., professor at the University of North Carolina at Chapel Hill and author of Explaining Creativity: The Science of Human Innovation, is that "usefulness" and "adaptability" also need to be defined -- meaning researchers often have to use other measures to determine who or what is creative. Some studies administer creativity tests to subjects, while other studies choose participants according to their occupation, like writer or artist, or their achievements, like Nobel or Pulitzer Prizes. 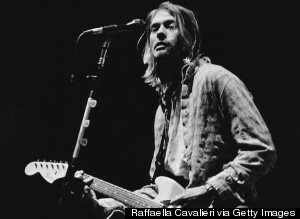 Singer-songwriter and guitarist Kurt Cobain performing with Nirvana in 1994. Cobain committed suicide in April of that year. Another challenge in studying the link between creativity and mental illness is that it's difficult to pinpoint where creativity actually "happens" within the brain. Researchers once thought that each of us had one dominant hemisphere of the brain, and that right-brained individuals were more creative while left-brained thinkers were more analytical. But while certain functions do take place in particular regions of the brain, research now shows that one side is never entirely dominant. "Imaging studies typically focus on the precise brain region where some activity is located, but there doesn't seem to be just one with creativity," Sawyer wrote in a 2011 review of creativity research. "It follows that associating [creativity] with the area in the brain affected by mental illness would be difficult." Andreasen told HuffPost that she is currently working on an imaging study using fMRI. She emphasized that the idea of the "tortured genius" is oversimplified, and not one she's pursuing. "People who are highly creative are intrinsically curious, exploratory, risk-taking, adventurous, and they're also persistent and somewhat rebellious or unconventional," she said. "When you have all of those traits, it makes you more vulnerable to rejection ... There's an underlying fundamental way of approaching life and the world that leads to both creativity and vulnerability to mental illness. But things like innate resilience and social support are what help these curious, adventurous, exploratory people not develop mental illness." In fact, Andreasen's own 2008 review of creativity research acknowledges many of the same problems with the body of literature supporting a potential link that Sawyer's does, including poorly defined measures of both creativity and mental illness and heavy reliance on self-reported data. In Sawyer's mind, the case is closed: There is no link between creativity and mental illness, and researchers should stop looking for one. He wonders if perhaps researchers are still searching for a link so they'll be able to provide a patient with at least a bit of good news. "I think if you're treating people it can be helpful in therapy to tell your patient that their mental illness has a silver lining" -- namely, the gift of creativity, he said. "[I think] that's where their willingness to believe in a link comes from." Still, outside of the research community, many remain open to the idea, as seen in the weeks following Williams' death. The bigger question now, says Sawyer, is why the general public is so receptive to this belief. The trope of the tormented artist is so widespread that for some people, it's almost something to be taken for granted. "As an artist in an artsy community, in some ways it seems intuitive that there is that correlation," said Ellen Forney, an artist who detailed her diagnosis with bipolar disorder in the graphic memoir Marbles: Mania, Depression, Michelangelo, and Me. Maybe, she hypothesized, artists can be more outspoken about mental illness than is accepted in other professions, or maybe mental illness somehow gives an advantage to people who work in creative fields. Historically, there have been creative thinkers who spoke about mental illness giving them their edge. "My fear of life is necessary to me, as is my illness," the artist Edvard Munch, thought to have had bipolar disorder, once wrote, according to Smithsonian magazine. "Without anxiety and illness, I am a ship without a rudder ... My sufferings are part of my self and my art. They are indistinguishable from me, and their destruction would destroy my art." Forney said she had similar reservations about treatment when she was diagnosed with bipolar disorder shortly before her 30th birthday. "I was terrified to go on any sort of meds [and] even questioning if I wanted to be a stable person, because I had the same romantic idea that a lot of people do about artists," she said. "That whole 'crazy' artist was definitely part of my perception of the field, and what I thought was creative in myself." Stability sounded "bland" to her, and many medications had a reputation for "flattening" creativity, Forney said. But after falling into a deep depression following the manic period during which she was diagnosed, she realized she needed help. Today, her treatment involves medication, therapy and lifestyle changes, and even stability has become important to her. "I found that stability was good for my creativity, because a part of creativity is productivity," she said. "When I was manic, I didn't have enough focus. When I was depressed, I was so squashed." In both cases, she said, "I couldn't get much done." 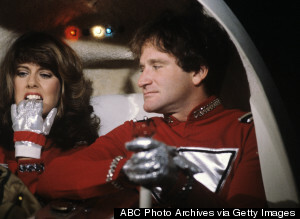 Pam Dawber and Robin Williams in a 1981 episode of "Mork & Mindy." Williams took his own life in August 2014. It's important to remember that in no way do cultural beliefs, anecdotal interviews or rigorous research suggest that being creative is cause for concern. Andreasen said that most of the creative thinkers she has studied -- with and without mental illness -- have spoken of the joy they derive from their creative pursuits. In fact, there's plenty of research indicating that creative endeavors can boost happiness and promote relaxation. "The more I've studied [creativity], the more I've realized we all have these amazing creative capacities in our brains," said Carson. "The ability to imagine things, to be able to see things in your mind that don't actually exist -- everybody can do that. You don't need to be mentally ill for that to occur." Have a story about depression that you'd like to share? Email strongertogether@huffingtonpost.com, or give us a call at 860-348-3376, and you can record your story in your own words. Please be sure to include your name and phone number.